Last Saturday turned out to be our chance to try it out. 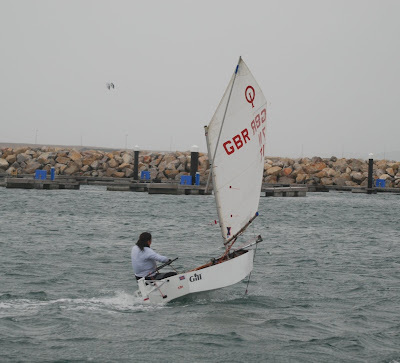 On the upper limit for Moth sailing, with the training weekend cancelled due to a horrific forecast for Sunday we went for it. 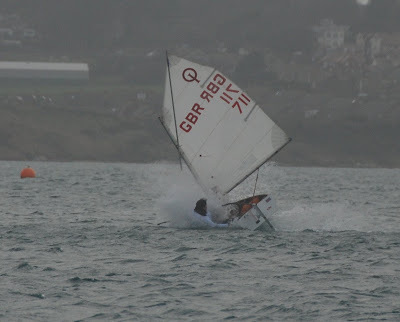 Still unsure if this would really work or not we went for a stealth approach, launching off one of the pontoons. 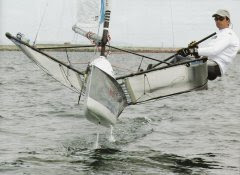 This was partly due to the fact that the Oppie hullform does not lend itself very well to being launched on its side, and righted in the water in typical Moth style, so we put the foils in on the dock, and rolled the boat in to avoid an early fill up.The rig was then lifted in, and our eager test pilot was released from the dock trying to remember how to sail an Optimist, and wishing we'd put some grip in the bottom of it! It certainly didn't leap out of the water like the Moths do, but it showed potential early on, nudging its nose skyward. We were struggling for rudder lift, and wound the gantry as far fwd as we could. 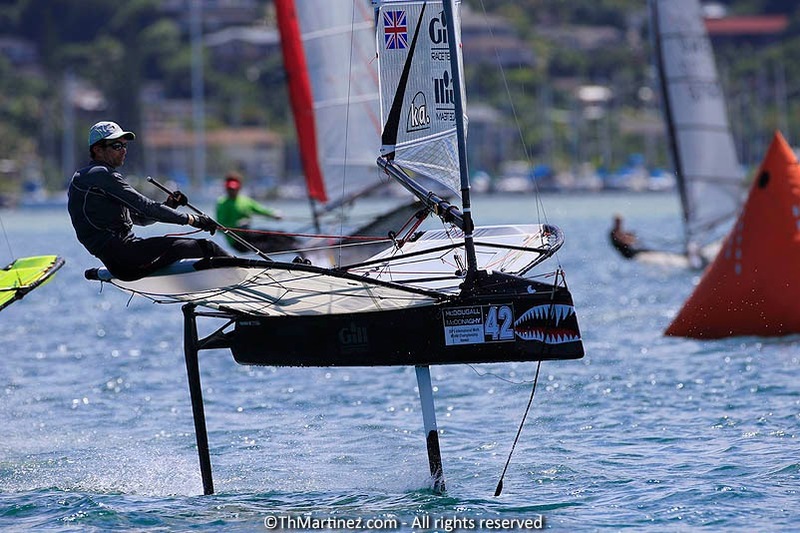 It was after this tweak that Katherine sailed out to the entrance, caught a big gust and the Oppie launched itself to max height on the foils. I was unfortunately still walking back to my camera, and missed the max height photo, but got to it in time to get the crash that followed. 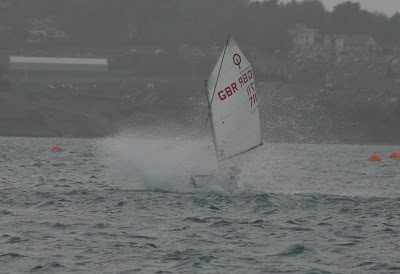 Any foiler will recognise that as a crash from height! We'd had visions of the rig falling down, or bits falling off if we had a crash but if you ignored some cracking wood noises all was fine. We tried several more times to get a decent photo of it in the air inside the marina, and although it was clearly working I never managed to get the shot with foils clearly visible. 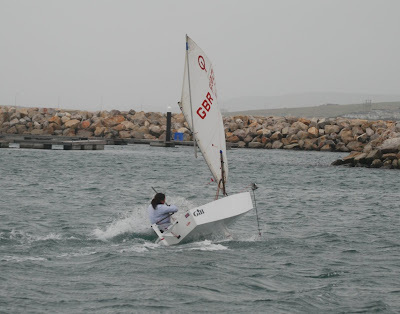 There just wasn't enough wind inside to do it, and we were still struggling for rudder lift. We called it a day, happy that the whole idea wasn't so stupid after all. 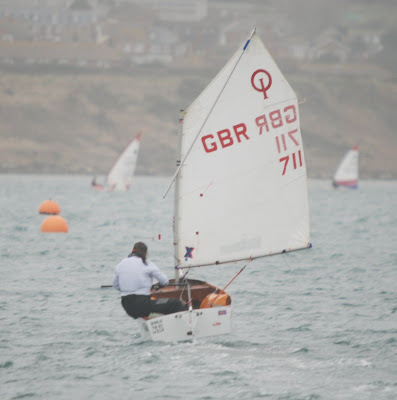 Next time we'll get a rib, and just send it out into the harbour looking for more breeze. I should probably finish with a health warning! It is probably not recommended for every Oppie dad to now go and plug some Moth foils into their kids Oppie! 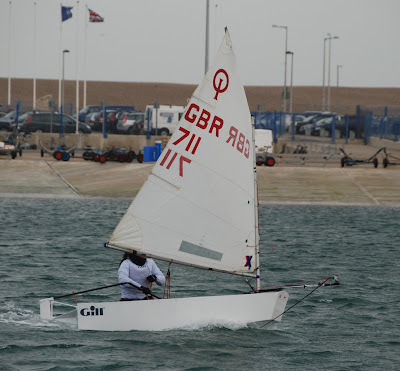 Although great fun to do, the narrow foil spacing, small rig, flat bow and launching issues do not make for the ideal first foiling boat! This was only ever intended as a one off proof of concept joke! Brilliant! As a recently-ex Oppie Dad, I've been wondering when it would be tried. Even considered it myself but..
Now with a lighter hull (must be some lighter GRP ones around) and a deeper sail, you could do even better! Keep up the bleeding-edge research - I wait with baited breath. 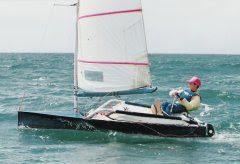 amazing i sail oppies and want to try it ........do you just swap foils or is it more complicated than that?